I tested the the new version 2.0.0.9 . From the client side I see the for exemple the mouse moving normaly but in my side take a long type to refresh. 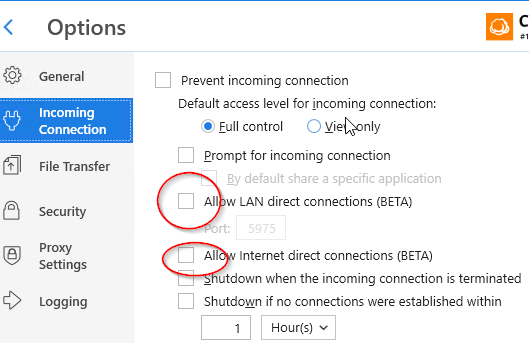 I disable the new option (LAN) , restart the service but same behavior. I make a rolle back of the version. Thank you for your feedback, this is a really interesting situation, may i ask you to send us Diagnostic Info from any of the machines used in the process so we can take a look at it from the software side. You can do this simply by going to Main Menu - Diagnostic and mention this forum post in the description. Thank you. I have been trying the new 2.0.0.9 version. The LAN Direct connection works nicely for other computers on the network, even via VAN. I still see one major issue, from before and a new issue. The previous issue is the problem of being disconnected when logging out of a computer profile. Sometimes I want to log out of one profile, such as admin, and log into another, such as user. But, when I log off of the first I get disconnected requiring reconnecting before I can continue. The second issue seems to be a new issue that I never saw prior to this version. If I lock a user profile then log back in, sometimes the screen is blank. Moving my mouse around on the screen appears to 'repaint' the icons and other items that should be there. Still, this is a great program and I love using it since another project keeps thinking I am a business user and limits my connection time to a useless amount of time. Thank you for this product and moving it forward. I unmarked the options of "lan" on both sides and works fine. With these options "on" is very slow the refresh on my side. Any hope to fix this bug in the next version of Windows Server Ultimate?